It’s never been easier to start your own mobile vehicle grooming business. We'll help you achieve a better lifestyle. Break free from the tedious 9 to 5 work routine and become inspired to reach your life goals. Now that you’re the boss you can make decisions that influence your success and prosperity. You can finally manage and enjoy a rewarding balance between valet work and family commitments. Perhaps the most rewarding element of owning your own valet business is that you’re the boss and you’re in control. That means you get to make the decisions and schedule jobs to fit your lifestyle — you hold the power to liaise directly with your customers to choose when you work. So, unlike paid employment, you have the freedom to create balance in your lifestyle between work and family commitments or holidays. We provide everything you need to run a mobile vehicle grooming business. We have a friendly team of experts on standby who are ready to help as you need it. Learn and prosper from the best by tapping into our award-winning expertise and experience. We’ll share with you everything you need to build your mobile vehicle grooming business, from tools and techniques to valet business management. It doesn’t matter if you have no experience in running a mobile vehicle grooming business because we have a team of experts available to support you as you need it. The award-winning Select franchise system is based on years of experience and success. Our role is to share all of the infrastructure, support, knowledge and training with you. Because your success is our success, so it’s in our best interest to help you every step of the way. We help remove the worry and uncertainty. You choose the monthly work level you want and we provide you with the customers. 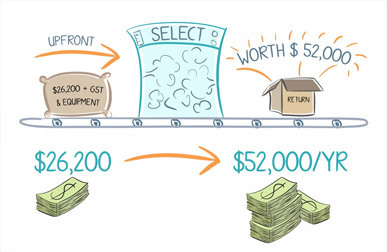 The one-off startup cost begins from as low as $13,000 (+gst & initial kit)* depending on your chosen package. You can choose to increase your earnings at any time simply by growing your customer base. SelectValet offer a range of starting packages to suit your preferred work level. Yes, that’s right, you can choose how much valet work you want and we’ll provide you with the initial customers required to meet that target, that’s the Select Guarantee*. A mobile vehicle grooming business with upfront costs of $26,200 (+ gst & equipment) will provide guaranteed* work that could be worth $52,000 or more per year — that seems like a great deal to us! What’s more, you can increase your mobile vehicle grooming business by growing your customer base over time. And by providing a superior mobile vehicle grooming service you’ll find that you can establish a great relationship with a loyal group of customers. * SelectValet offers a specific guarantee subject to the terms & conditions of the Franchise Agreement. Discover how easy it really is. Don't stall, contact us for more information now. Simply complete and submit this form to receive more detailed information about the SelectValet franchise including the package prices and options. © Copyright 2019 Select Valet. All rights reserved.